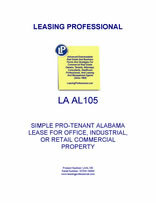 This form is for a single tenant Alabama lease where the tenant has superior leverage. It gives the tenant the right to use the premises for "any legal use," and has very abbreviated remedies for the landlord in the event of a tenant default. It is also pro-tenant in character because of the clauses it does not contain which customarily appear in pro-landlord forms relating to remedies and a variety of other pro-landlord provisions. Alabama was the 22nd state to join the US in 1819. Alabama is the 30th largest state in the union in terms of land area, and is part of the southern United States. Geography dictates that most of Alabama's land is a plain that slopes gradually towards the Mississippi River to the west and the Gulf of Mexico to the south. Major cities in Alabama include the capital, Montgomery and several large metropolitan areas, including Birmingham, Mobile and Huntsville. The population of the state is fairly spread out and concentration in the metro areas is considerably below average for the United States.